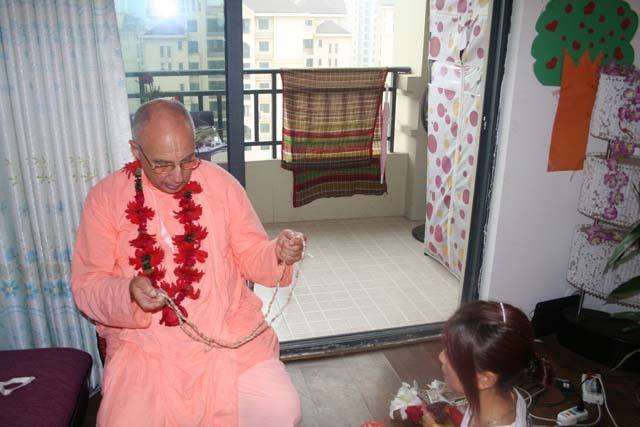 During the month of October 2012, Srila Janardan Maharaj travelled to China to visit with Yudhamnayu Prabhu Seva Vikram and the Chinese devotees. 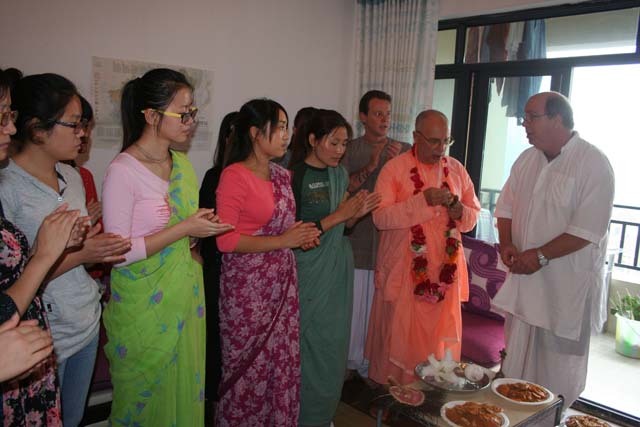 Accompanied by Satrughna Prabhu (Shuggie), they went to Chongqing and Shenzhen, where they were warmly greeted by the Chinese devotees. 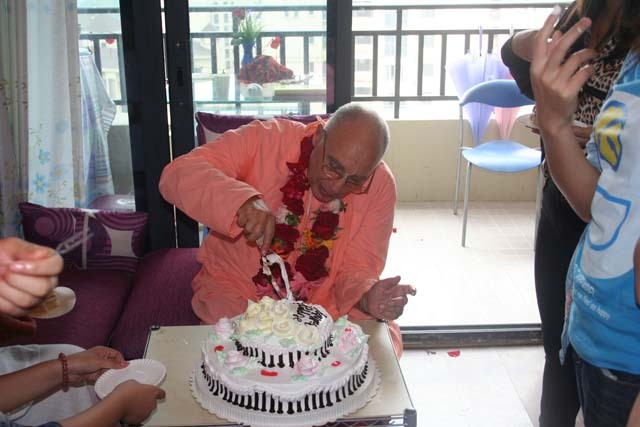 Everyone was extremely happy to have Srila Janardan Maharaj’s association. 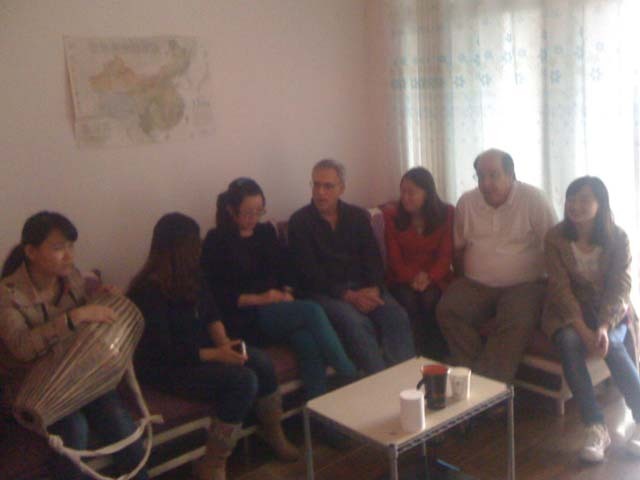 Here are some pictures from that tour. 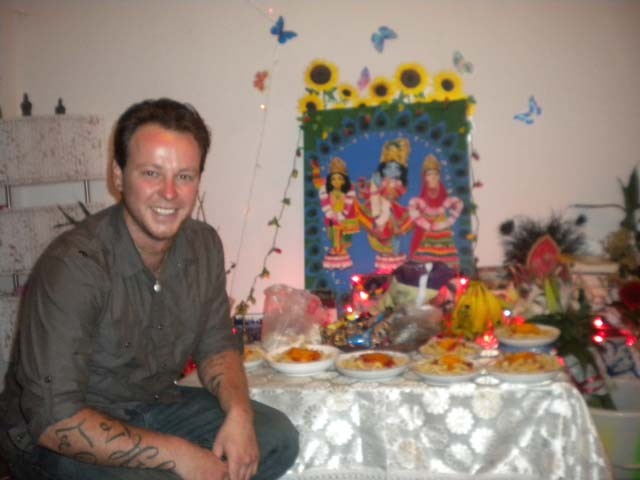 With Yudhamanyu Prabhu Seva Vikram, Satrughna Prabhu and the devotees. 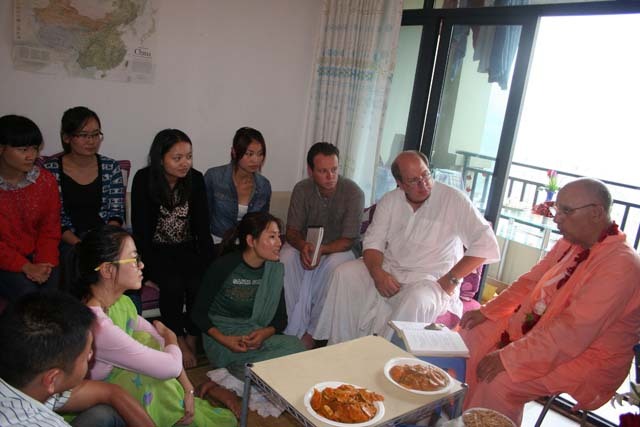 Sita Devi (center) translates Srila Janardan Maharaj's talk into Chinese. Back left to right: Yudhamanyu Prabhu Seva Vikram, Srila Janardan Maharaj, Satrughna Prabhu. Front left to right: Madhumita Devi, Sita Devi, Ananda Devi. Srila Janardan Maharaj ki jay! Srila Janardan Maharaj leads the devotees in kirtan. Everyone is enthusiastically chanting and clapping during the kirtan. 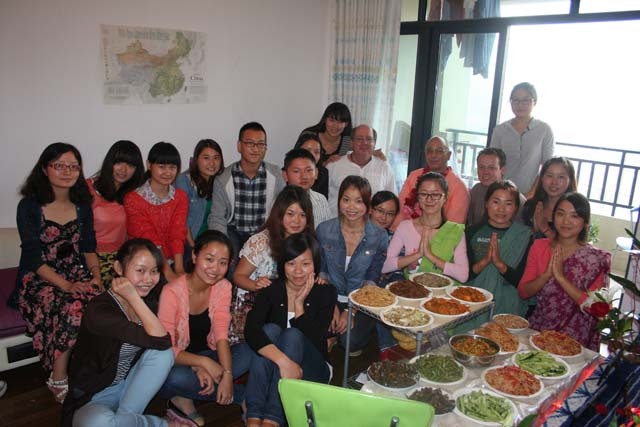 All the guests and the Chongqing devotees. 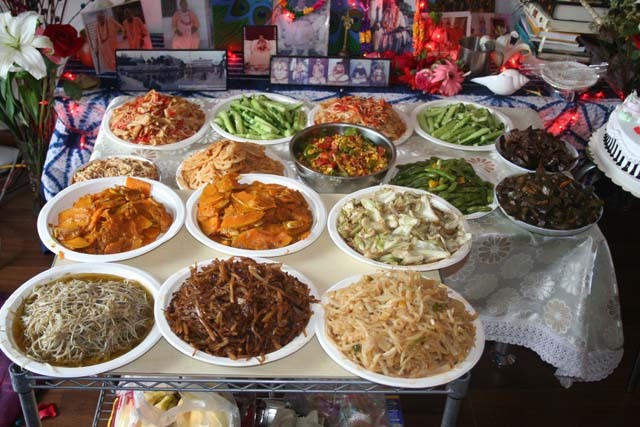 For Sri Radhasami, the devotees prepared a sumptuous feast and offered everything to Sri Guru and Sri Gauranga. Satrughna Prabhu (second from right) traveled the whole trip with Janardan Maharaj. Satrughna Prabhu ki jay! Shuggie Prabhu ki jay! Several sincere souls asked Srila Janardan Maharaj for initiation. Srila Sridhar Maharaj wrote: "Intitiation into the mantra means to impart real knowledge and devotional sentiment from one to another." 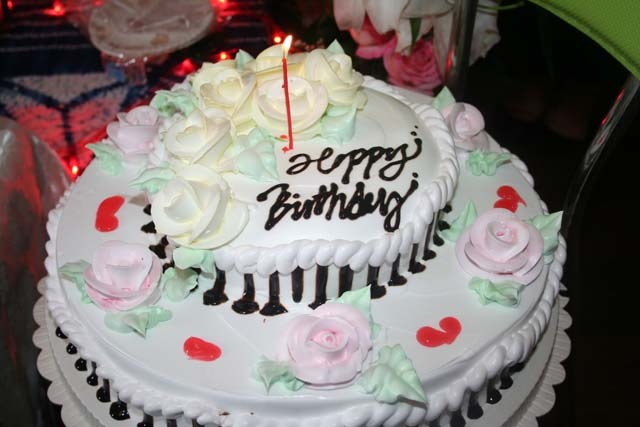 Kishori Devi Dasi ki jay! 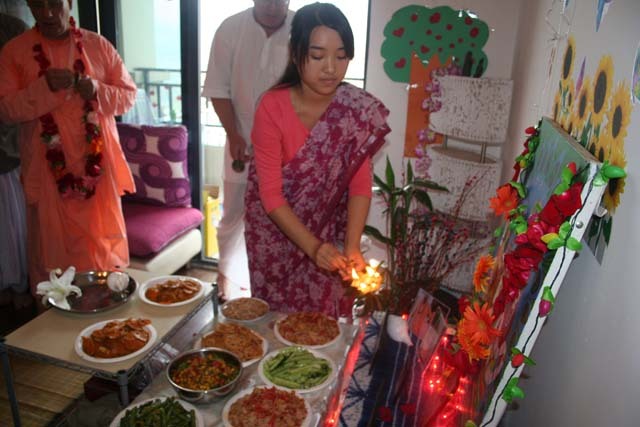 Tulasi Devi Dasi ki jay! 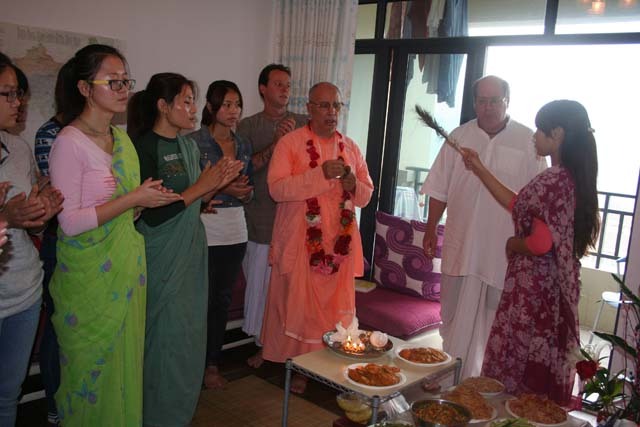 Sita Devi & Madhumita Devi receive second initiation from Srila Janardan Maharaj. Srila Janardan Mahraj ki jay! Sripad Yudhamanyu Prabhu Seva Vikram ki jay! 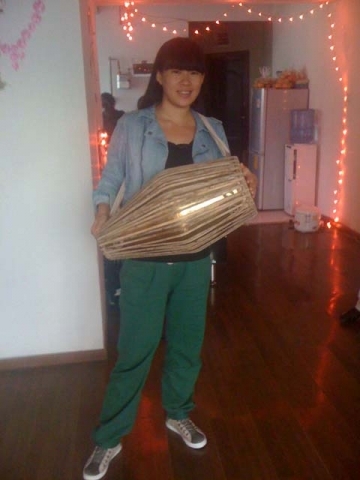 All the Chongqing devotees ki jay! 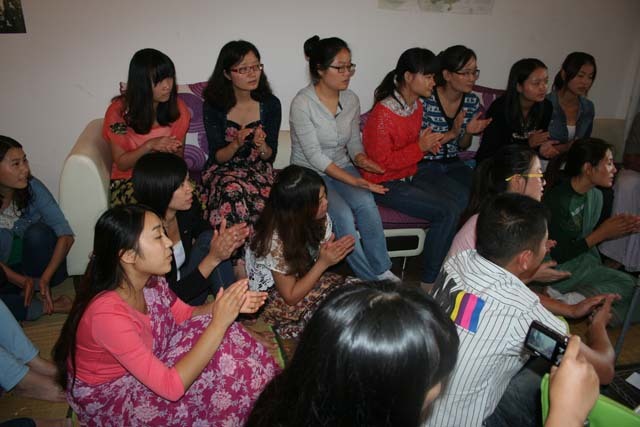 Dr Su was instrumental in helping Yudhamnyu Prabhu become established in China. 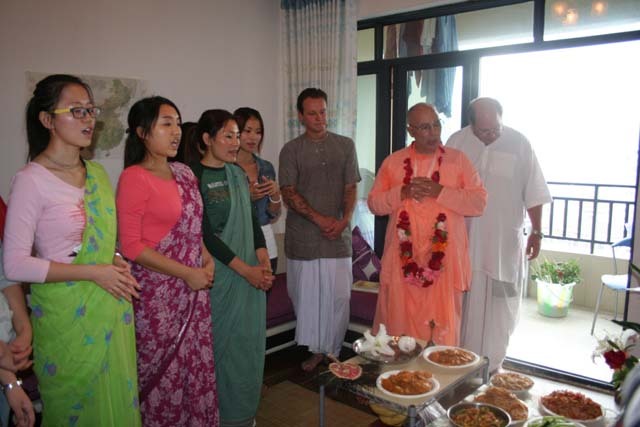 Dr Su and his wife Mrs Hao visited our Soquel Seva Ashram in the summer of 2012. They were very happy with their visit and afterwards he commented to Yudhamnyu Prabhu that everyone at the Seva Ashram was smiling from their hearts! Yudhamanyu Prabhu, Sita Devi & Hasyapriya das took the high speed "bullet train" from Chongqing to Chengdu. 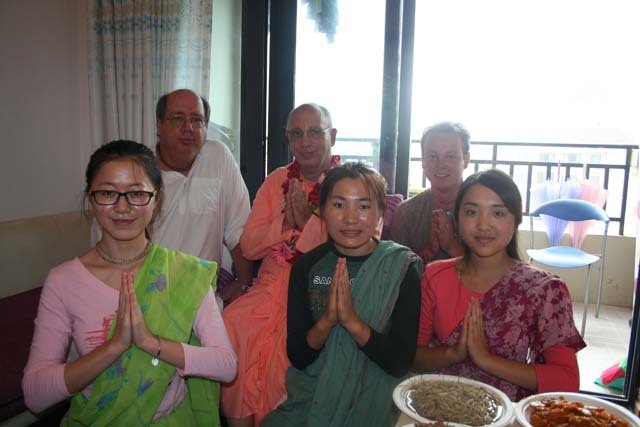 Left to right: Mrs Hao, Hasyapriya das, Yudhamanyu Prabhu, Dr Su, Carole & her daughter "Little Tiger"
Sudevi Devi Dasi (left) the first initiated disciple of Srila Govinda Maharaj in China. 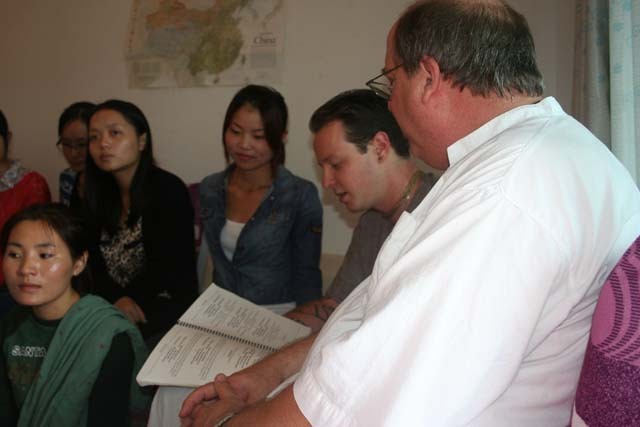 Robert (left) who along with his wife Carole, helped Yudhamanyu Prabhu when he first arrived in China. 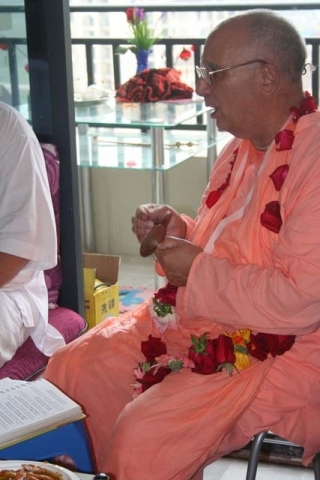 Srila Bhakti Nirmal Acharyya Maharaj ki Jay! The painting by Urmila Devi Dasi of Sri Sri Guru Gauranga Gandharvika Girihari is worshiped by the devotees in Chongqing. 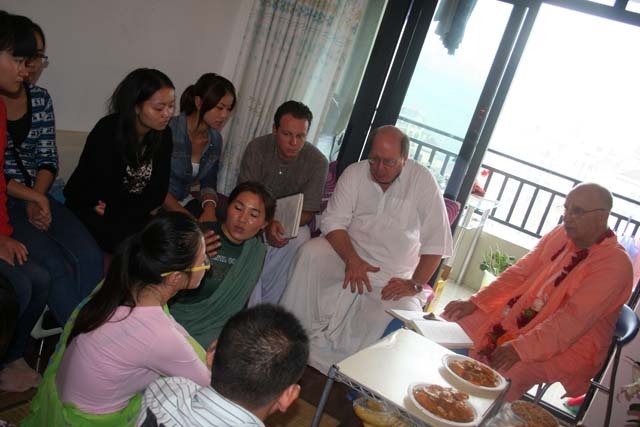 Yudhamanyu Prabhu reads from Srila Govinda Maharaj's book to the Chinese devotees and guests. 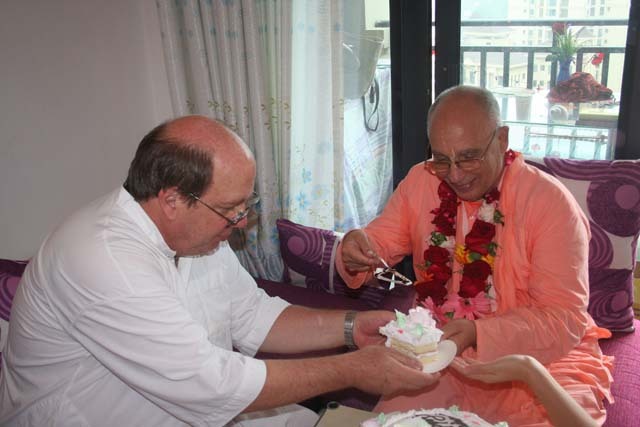 Srila Janardan Maharaj & Paramananda Prabhu. 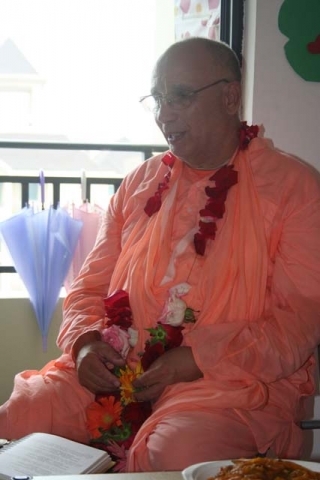 Paramananda Prabhu has been traveling and preaching in Thailand, China, Japan and other Asian counties for many years. 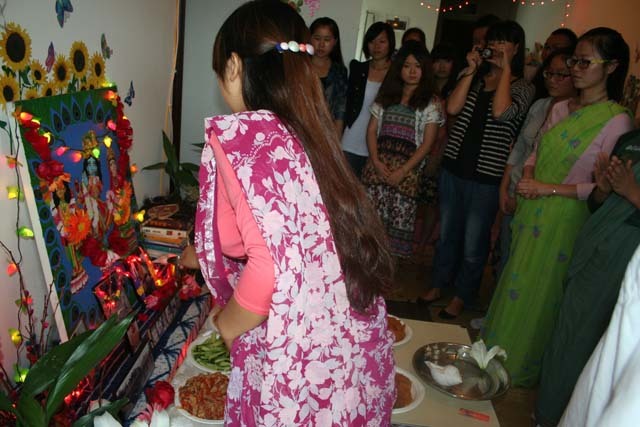 Jayavati Devi Dasi is the leader of the Shenzhen center. 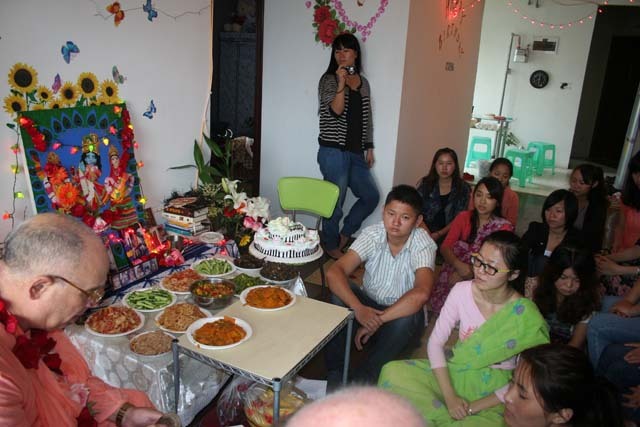 Many devotees and guests came to get Srila Janardan Maharaj's association in Shenzhen. 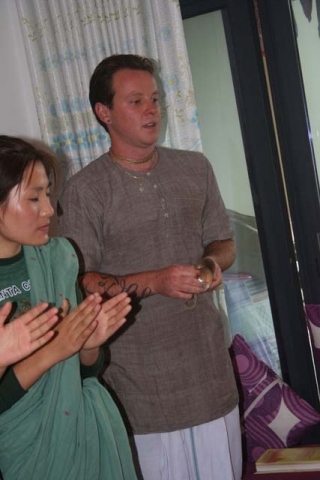 Satrughna Prabhu gives a mridanga lesson to one of the Chinese devotees. Up on the roof for the "Full Moon" festival. 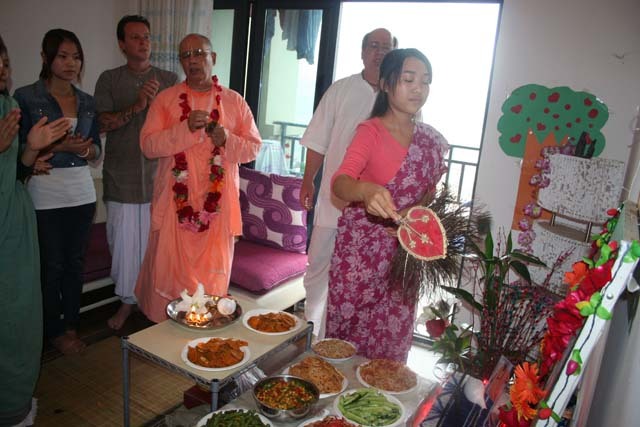 Jayavati Devi, who is a very good preacher, explains our philosophy to the devotees and guests. Jayavati Devi, Indumukhi Devi and a guest. Back row left to right: Indumukhi Devi, Nalina Devi and a guest.